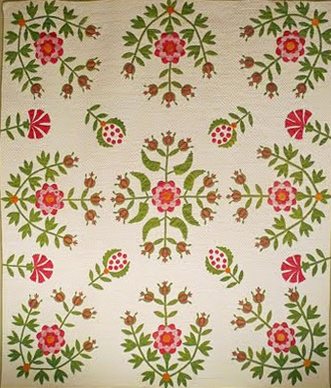 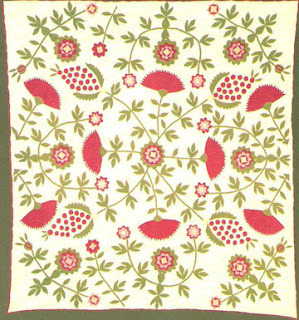 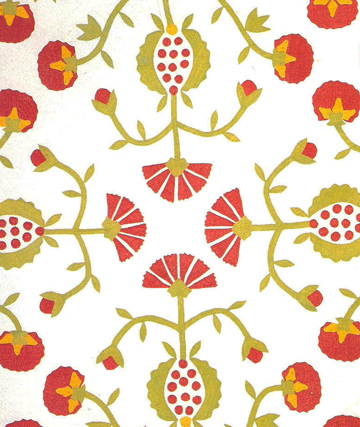 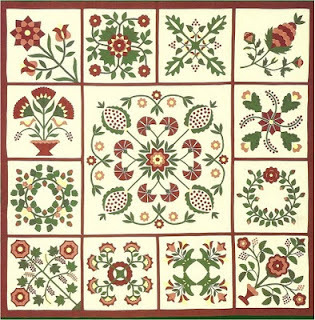 From the cover of Quilters' Newsletter #157, November/December 1983...One of a series of similar appliques from the mid-19th-century. 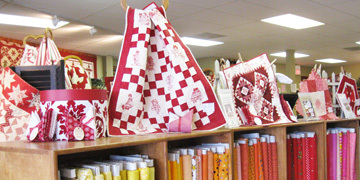 Have you seen the article in the Jan/Feb issue of QuiltMania about Australia's Castlemaine Applique Society? 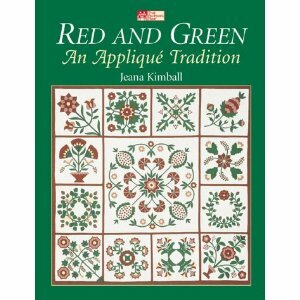 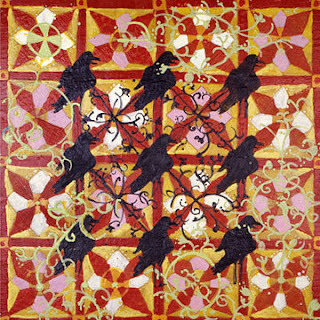 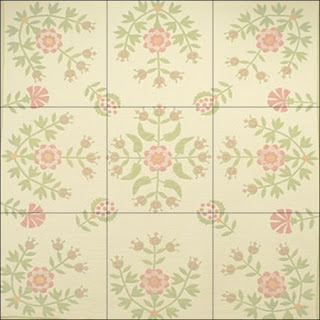 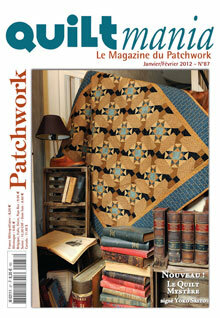 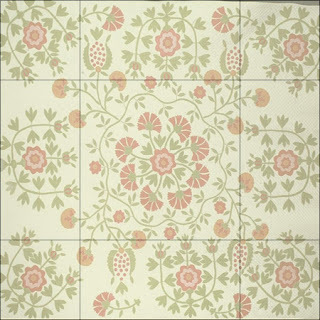 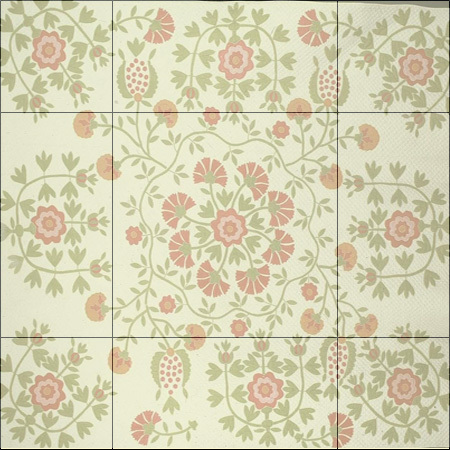 It features terrific applique quilts inspired by antiques. 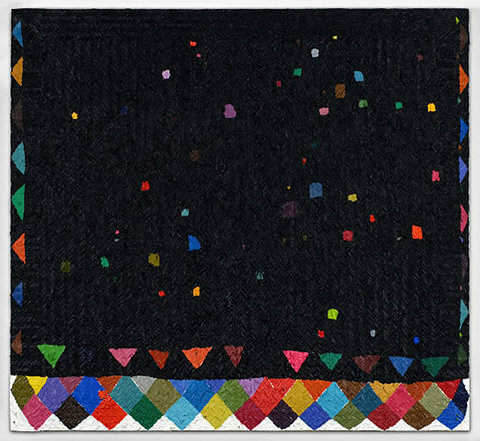 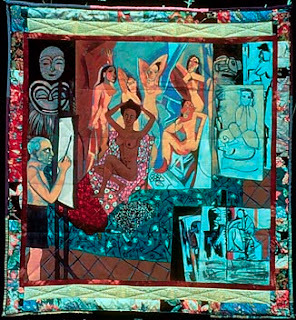 The one that caught my eye is this version of a quilt that was on the cover of Quilters' Newsletter many years ago---the quilt at the top of the page. The pattern seems to have been drawn up by Deb King and they call it "Deb's Not Quite Telling the Truth." That Quilters' Newsletter (30 years ago!) 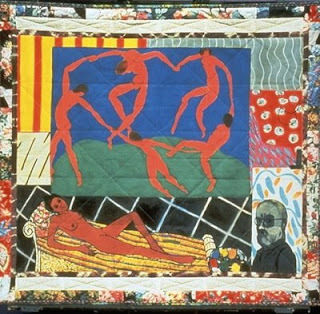 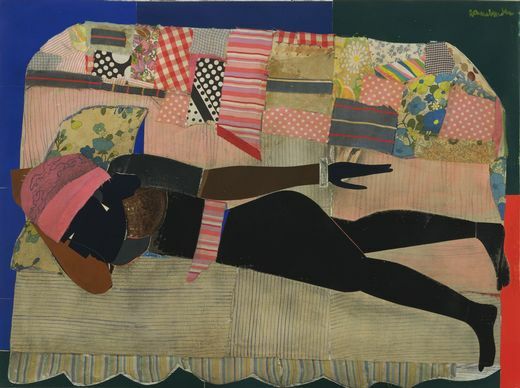 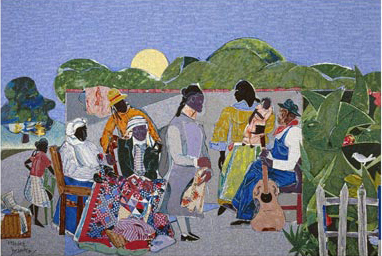 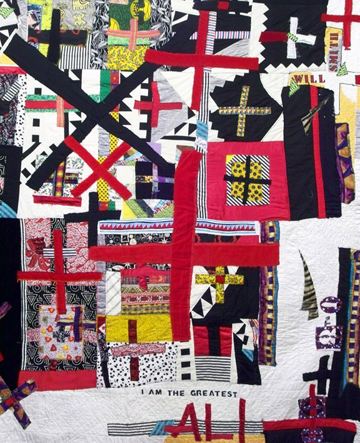 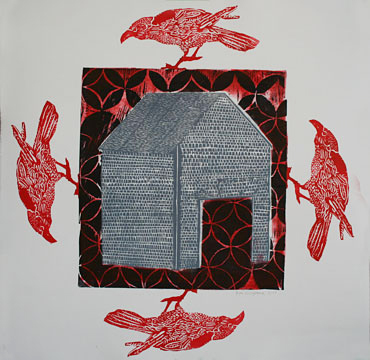 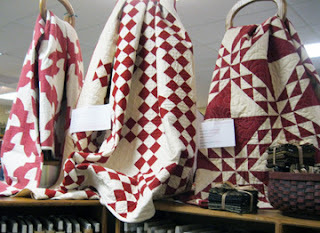 had an article by editor Louise Townsend about the imagery in that quilt. 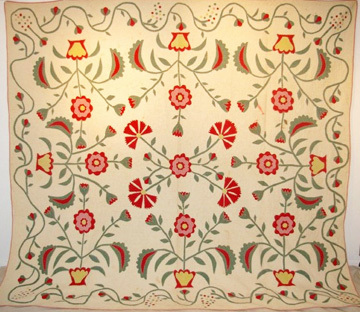 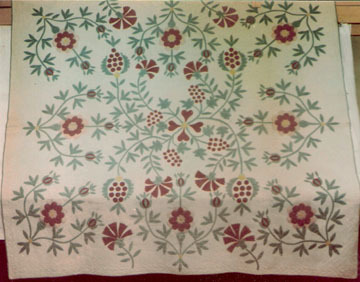 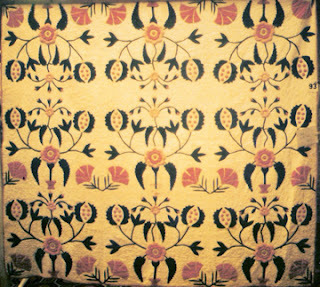 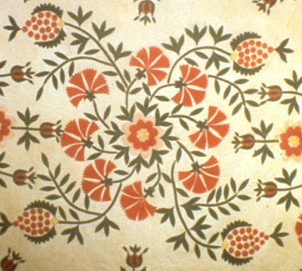 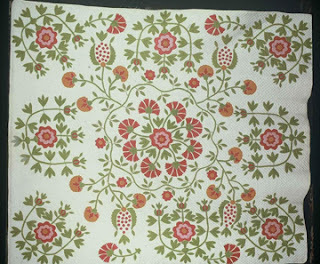 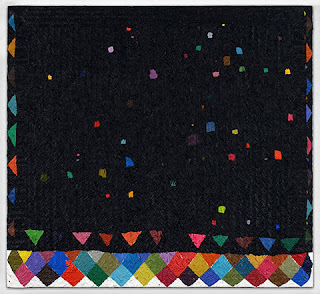 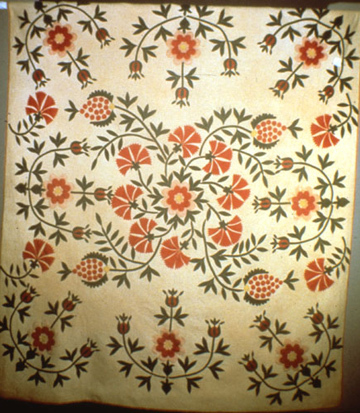 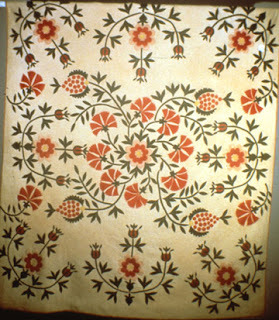 Numerous quilt detectives worked trying to find an origin for quilts with similar designs. 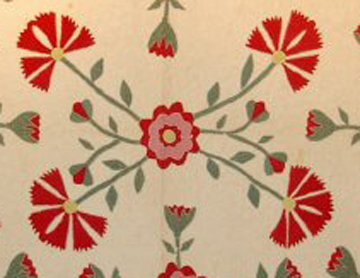 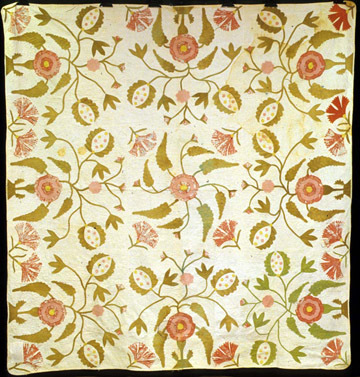 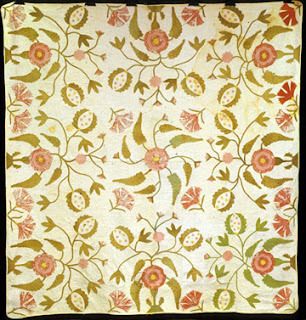 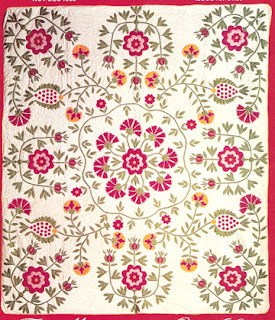 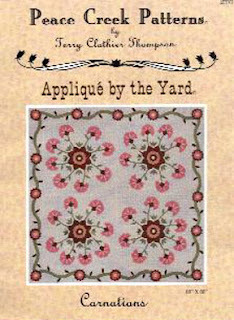 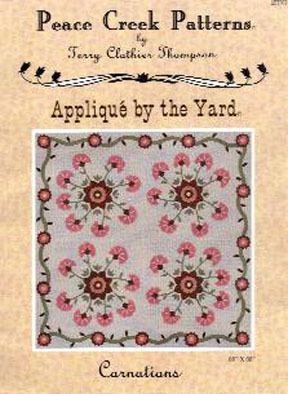 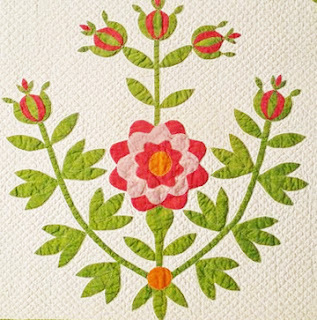 One rather unusual image in the quilt is a carnation-like floral with pinked petals. 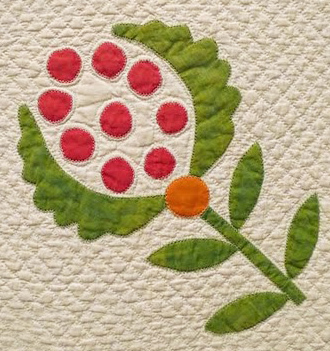 Another is the pineapple or pomegranate made of dots. But it's not just those two images, it's the way they are arranged, often in rather haphazard fashion. 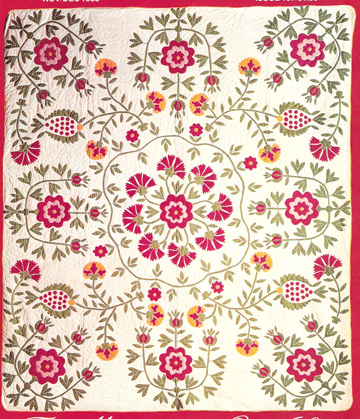 This quilt is so similar to the one at the top of the page it's hard to tell them apart. 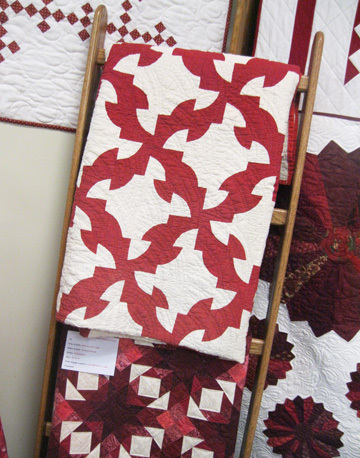 And Terry Thompson did the center as a four-block quilt for this pattern. 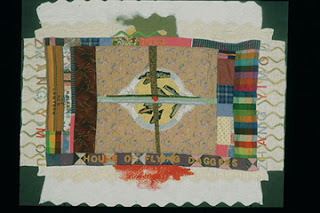 Years ago Louise and I collected pictures. And this one in the Museum of the Daughters of the American Revolution, made by Lucy Kemper West in Garrard County, Kentucky. 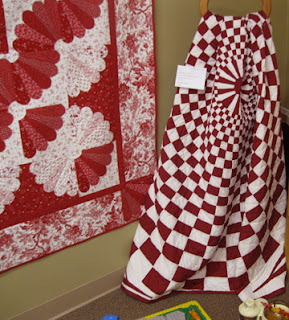 I found this one with the note it was from the Nebraska Quilt Project. 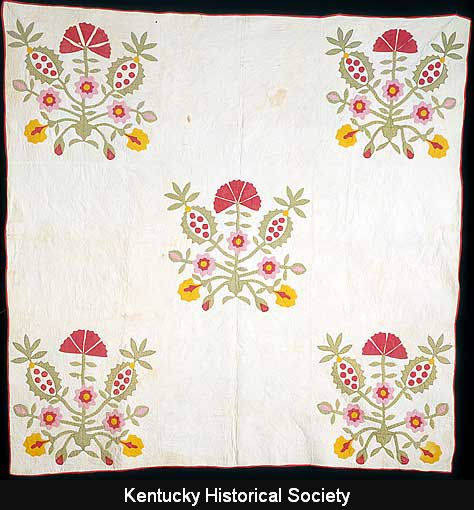 Katy Christopherson of Kentucky also did some research on the quilts in an article called "Tracings: Quilts and Cousins" in the September/October 1984 issue of In Kentucky. 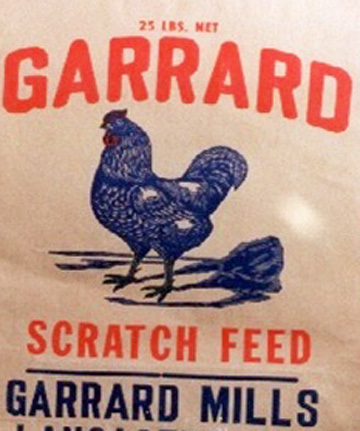 Many times when we found a link to a maker and a place it was Garrard County, Kentucky. Marion County is close to Garrard. 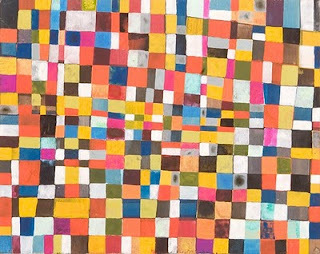 Although there is order in even the most chaotic of them. 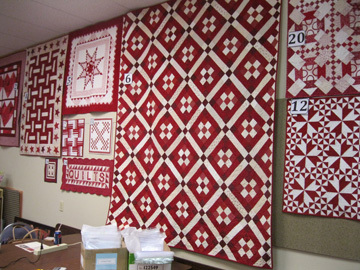 Most are based on a 9 block, although the blocks don't repeat. One block in the center, four different blocks at north,south, east and west and sometimes another in the corners. 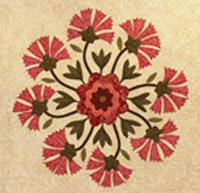 Variations of this Rose Tree are found along the edges. Here's a relative with the carnations but no pineapples, The dots migrated into the border just as the pattern has now migrated to Australia. 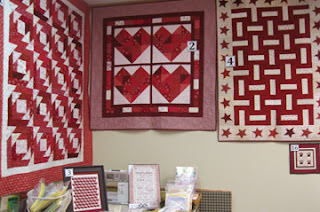 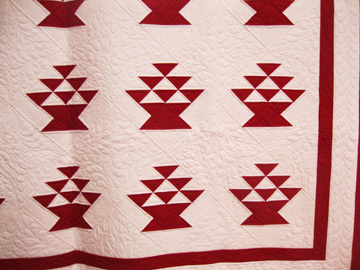 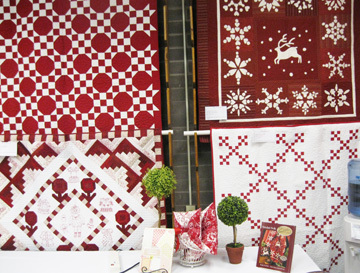 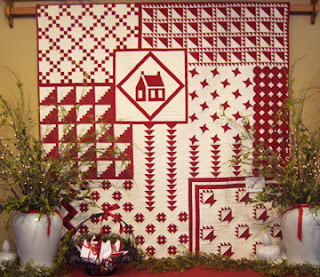 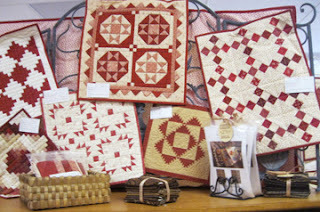 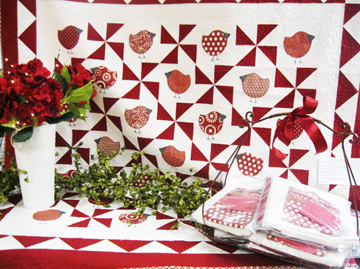 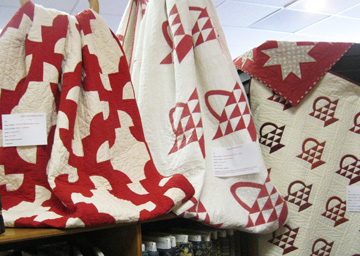 Impressed with last spring's Red and White Quilt Show in New York, Carol at Prairie Point Quilts in Shawnee, Kansas, has blanketed the shop in red and white quilts for two weeks in February. 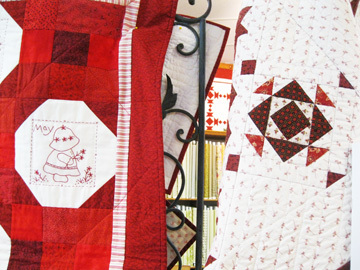 She and her friends made red and white quilts. 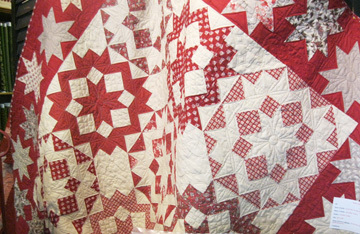 And she's asked for donations of red and white quilts to be auctioned for the American Heart Association. There are over sixty quilts big and small in the store. There are a few antiques. They come down on the last day of February. 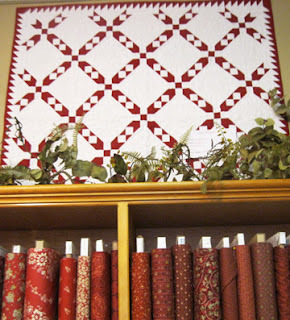 Good thing February is extra long this year. 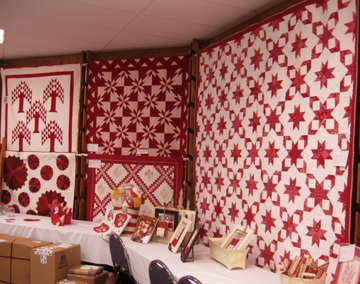 There's even a copy of the show stopper at the New York show.